Ladification?여기 젠트리피케이션의 새로운 형태로서 특이하게 성별화된, 특히 젊은 여성이 주도하는 이국적인 것의 소비성향에 의한 젠트리피케이션이 있다. 이것은 특히 외국 음식을 통한 소비에서 확실히 보이는데, 가장 두드러지는 곳은 서울의 해방촌/이태원지역이다. There is a new, singularly peculiar pattern of gendered gentrification driven by young, women-led consumption of foreignness. This is especially true in the consumption of via foreign foods, most notably in the Haebangchon/Itaewon area of Seoul, South Korea. 서양에서 문제가 되어온 전통적인 형태의 젠트리피테이션은 가난한 주민이 살던 지역에 어떤 ‘쿨’함이 생겨나면서 이로 인해 사회경제적으로 우위에 있는 집단이 방문하고, 먹고, 그리고 생활을 하고 싶은 장소로 바뀌면서, 마침내 상업비용이나 주거비용이 문화적으로도 재정적으로도 원래 살던 주민이 더 이상 살 수 없는 지점까지 오르게 되는 현상을 말한다. 오랫동안 살았던 거주민은 자기가 살던 동네에서 이방인이 되고, 그 이전에 작아지고, 비싸지고 적대화된 주택시장에서 경제난민이 되어 새로 살 집을 구해야만 하는 처지가 된다. 특히 미국의 경우 이 문제는 인종적인 관점에서 뚜렷한 표현으로 나타나는 경향을 보이는데, 그 문제가 되는 사회적 표현 방식은 상황과 장소에 따라 다르더라도 그 형태는 비슷하다. Traditional patterns/definitions of “gentrification” in the sense it has become an issue in the West have defined a conversation in which people have become concerned with the way certain, formerly poor communities become seeded with “cool” when they become desirable places for members of an advantaged socio-economic class to meet, eat, and then live, which eventually drives up commercial then residential rent prices to the point that the area become a culturally untenable, fiscally unaffordable place to live. Longtime residents quickly become strangers on their own former communities, and before long become economic refugees forced to look for new homes in a shrinking, expensive, and increasingly hostile housing market. In the United States in particular, this problem tends to find sharp expression through the social dimension of race, but the pattern is similar, even if the particular problematic points of social expression differ from case to case and place to place. The highlighted red areas are heavy zones of ladification. 한국에서 젠트리피케이션이란 부정적인 의미로, 역사적으로는 강제 개발의 형태를 취하며 서양과는 또 다른 패턴에 따라 일어나는 경향이 있다. 현대적인 것과 새로운 것이 숭배받는 개발지상주의문화에서 개발과 발전이란 긍정적인 의미를 가지고 있어서, 어떤 곳을 재개발(실제로는 개발)을 한다고 할 때, 설사 그 개발이 누군가는 정당한 보상없이 집을 잃는다는 뜻이라 할지라도 거기에 반대하는 것은 쉽지 않다. 그런 의미에서 젠트리피케이션은 한국형 재개발 현상이 영어 ‘gentrification’으로 번역되면서 부정적 의미를 갖게 된다. 그러나 ‘해방촌’이란 별칭이 붙은 용산동2가에서 벌어지는 현상은, 위의 두가지 젠트리피케이션 유형과는 상이하면서도, 부분적으로는 양쪽 다 해당한다고 볼 수 있다. 그러나 해방촌이라는 별명으로 불리는 용산동2가에서 일어나고 있는 현상은 이 두 가지의 젠트리피케이션 유형과는 다르면서 또한 부분적으로는 양쪽의 경우에 모두 해당이 된다. 해방촌에서 일어나고 있는 일은 매우 성별화된, 소비주도의 젠트리피케이션으로 이것을 더 적절하고 구체적으로 (그리고 발칙하게) 묘사하면 ‘레이디피케이션’이라 할 수 있는데, ‘젠트리(신사)’가 지역을 점령하는 것을 젠트리피케이션이라 하니 동등한 상황을 여성특화하여 적용한다면 그렇게 되지 않겠나. 만약 지역이 남성, 즉 젠트리에 의해서 점령이 되는 것이 아니라 레이디(숙녀)에 의해 것이 된다면 레이디피케이션이란 단어는 보다 적절한 사용이 될 것이다. But what’s happening in Yongsan-dong 2-ga, colloquially nicknamed “Haebangchon”, is different from both of these models of “gentrification” while being partially describable by both. What’s happening in Haebangchon is a highly gendered form of consumption-driven gentrification, which can be more aptly, specifically (and cheekily) described by the term “ladification,” if one decides to take on the female-specific equivalent to the descriptor for an imagined “gentry” taking over an area. If one were to imagine that an area has been taken over not by members of a gentry, but by ladies, then the term “ladification” makes better, more proper sense. 나는 현재 한국에서 이 특이하고 고유한 새로운 형태의 젠트리피케이션으로 생각되는 레이디피케이션에 대한 민족학적 연구를 진행 중이다. 이것은 새로운 종류의 사회경제학적 현상으로 볼 수 있는데, 이 현상은 최근 한국을 근본적으로 변화시키고 있는 소비주의 혁명의 한 부분으로, 모든 면에서 민주주의 운동이 정체성, 행동, 사회 관습의 개념에 미친 영향과 같은 수준으로 볼 수 있다. I am presently conducting ethnographic research on what I see as a new kind of gentrification – “ladification” – that is particular and peculiar to Korea. It is a new kind of socio-economic phenomenon, since it is occurring as a part of the consumerism revolution that is fundamentally changing Korea in recent years, on a level that is every bit as socially impactful as the democracy movement was on Korean notions of identity, behavior, and social mores. 해방촌에 처음 이사온 2012년 여름은 내가 심각한 교통사고의 후유증으로 생긴 충격과 실직으로 생활에 큰 변화가 있은 직후였다. 당시 살고 있던 비싼 오피스텔에서 나와서 어딘가 싸면서도 사진작가와 대학교수를 하면서 수집한 많은 책들을 위한 넓은 공간이 필요했었다. 처음 해방촌에 이사 왔을 때 해방촌은 내게 그저 몇번 미국음식을 먹으러 왔던 곳일 뿐이었다. 이태원은 외국인들이 즐기는 곳이라면 해방촌은 그들이 실제로 먹고, 살고, 쉬는 곳 이었다. 나는 이곳을 외국인들의 게토쯤으로 생각하고 그런 인식을 공유하는 사람들을 만나러 왔을 뿐이었다. 내게 해방촌은 격이 떨어지는 곳처럼 느껴졌고, 미국에서 내가 전혀 살고 싶지 않았던, 사회학자들이 ‘소수민족거주지’라 부르는 차이나타운이나 리틀이탤리 같은 곳이었다. 그렇지만 내겐 선택의 여지가 별로 없었고 지금 힐카페의 맞은편에 있는, 꽤 넓으면서도 내 대학교수 월급에 맞는 적당한 가격의 집을 구했다. I first moved to Haebangchon in the summer of 2012, after my life had been interrupted by the aftermath of a major traffic accident that left me stunned, unemployed, and needing to move out of my expensive officetel and find somewhere that was cheap yet spacious enough to house all of my many books and things that I had amassed in my life as both photographer and university professor. When I first moved to Haebangchon, it was what I had seen from the few times I had been here to eat real American foods. Itaewon was where foreigners played; Haebangchon was where they actually lived, ate, and relaxed. I had thought it as “the foreigners’ ghetto” and came to see that others shared that perception. For me, it felt like a downgrade, as I had never wanted to live in what sociologists in the US call an “ethnic enclave”, e.g. “Chinatown” or “Little Italy.” Yet, I had little choice, and the place I found across from what is now the Hill Café is quite spacious and reasonably priced for my university salary. 이런 내가 놀라게 된 것은 예전의 부동산이 보니스라는 피자펍으로 바뀌는 것을 보았을 때 였다. 처음에는 그저 동네에 넘쳐나는 펍을 하나 더 연다는게 좋은 생각인 것 같지 않았다. 그런데 이 곳이 20대 여성들로 가득찬, 지역에서 가장 인기있는 장소 중에 하나가 되어 건물 밖에까지 줄을 서고, 남자라고는 여자친구와 함께 온 것이 확실해 보이는 남자들만 보이는 것에 놀라고 한편으로 매료되어 지켜보았다. What surprised me was when I watched a former budongsan be transformed into a sports/pizza pub, now called Bonny’s. I initially thought a another pub on a street full of pubs to be a bad idea, but watched with growing surprise and fascination as that pub became one of the most popular establishments in the area, filled to the brim with 20-something women and girls, with a line outside the building, with the only males in sight being those in tow alongside the girlfriend who had obviously brought them along. 20대와 30대 초반 여성들은 무리를 지어 중,고등학교 친구나 대학 친구들과 작은 동창회 모임처럼 모이고 커플들은 색다른 데이트를 찾는다. 그리고 이들의 소비능력은 지역의 상업적인 기업과 비즈니스의 속성을 바꾸고 있는 것처럼 보였다. 곧 작은 주스가게 밖에도 줄을 서고 충분한 고객과 자본을 확보한 가게는 예전에 지역의 외국인 커뮤니티에 식사를 제공하던 식당(헝그리독)을 사들였다. 진짜 미식가들을 타겟으로 한 고급 식당들(라 마마이트, 디 아워스, 맥코이스)이 흔해지고, 세탁소는 멋진 라운지(서울 바이닐)로 바뀌어서 실제로 유명한 가수가 그곳에서 술을 마시는 것을 직접 보기도 했다. Groups of women in their twenties and early thirties would come in groups, as old friends from middle and high school, as well as college, would gather for mini-reunions, and couples would go for a different kind of date. And the consumptive power of these women seemed to be changing the nature of the kinds of commercial enterprises and businesses in the area. Soon, a tiny juice place (My Juice) had a line out the door and had gained enough customers and capital to buy out an established diner/bar that had primarily catered to the local, foreign community (The Hungry Dog), high-end bistros targeting real gastronomes (La Marmite, The Hours, or McCoy’s) became common, and a former laundromat became one of the coolest vinyl records lounges in Seoul (Seoul Vinyl), where I have personally seen musician and producer Pak Jin Young drinking and hanging out. 이 새로운 성별화된 소비패턴은 상업적으로 문화적으로 지역을 변화시키고 있고 이 점이 내겐 무척 흥미로운데, 특히 상가의 세는 폭등했으나 주거지역의 세에는 크게 영향을 미치지 않았다는 것을 발견했다. 해방촌에서 소비하는 많은 여성들이 해방촌에 사는 것은 원하지 않는다는 점은 한국의 문화적 사고 패턴이 어떻게 동일하게 유지되고 있는 지와 관련이 있다고 생각한다. 외국문화를 소비하는 것 또는 이국적인 것 자체에 대한 생각조차 일상 생활에서 분리될 수 있을 때 더 쉽다는 것인데 외국문화를 소모품으로 편리하게 분류하고, 환상공간으로써 방문하기에는 좋은 곳이나 한국인으로서 꼭 살기에 좋은 곳은 아니라는 것이다. 그 곳이 아무리 즐거운 곳이라 할지라도 말이다. The way this new gendered consumption pattern has changed the commercial and cultural makeup of the neighborhood is of great interest to me, especially in that I have noticed that even as commercial rents have skyrocketed in the area, they have had relatively little real effect on residential rental prices in the area. I believe this has to do with how Korean cultural patterns of thinking remain the same, as many of the young women who consume in Haebangchon definitely do not want to live in Haebangchon. Consuming foreign things, or even the idea of foreignness itself, is something that is easier to do when you can separate that from one’s everyday life, in that one can more comfortably compartmentalize foreign things into consumables, and visit them as a fantasy space in that is a nice place to visit, but as a Korean, not necessarily a place to live, no matter how much fun it is to visit. 이것이 내가 주제에 접근한 방식이고 아직 가게 주인들과 거주민, 방문객들 인터뷰를 통해 더 많은 부분을 연구해야 한다. 나는 아직 이 젊은 여성들이 외국 문화를 소비하는 새로운 방법이 강조된, 드물게 특이한 성별화된 젠트리피케이션(레이디피케이션)현상에 대한 기사를 쓰기 위한 민족지학 연구 중에 있다. This is the way I am approaching the subject, and I have a lot left to learn from my interviews with storeowners, residents, and visitors. I am still finishing up my ethnographic research for the article I am writing on the singularly unique phenomenon of gendered gentrification (ladification) that highlights a new kind of consumption going on around how young women want to consume foreign cultures. 해방촌과 외국문화 그리고 젊은 여성들이 소비하고 싶어하는 음식문화는 한국의 전통적 성별 규범과 젊은 여성들이 종종 직면하는 정체성의 축소로부터의 탈출로 정의될 수 있다. 해방촌은 이 여성들을 위한 음식문화적 탈출구가 되었으며 이것이 이 지역의 레이디피케이션이 젊은 여성들의 소비 선택에 의해 정의될 수 있는 이유이다. Haebangchon and the foreign cultures and foodways that young women like to consume, define an escape from traditional Korean gender norms and constrictive notions of identity that young women often face. 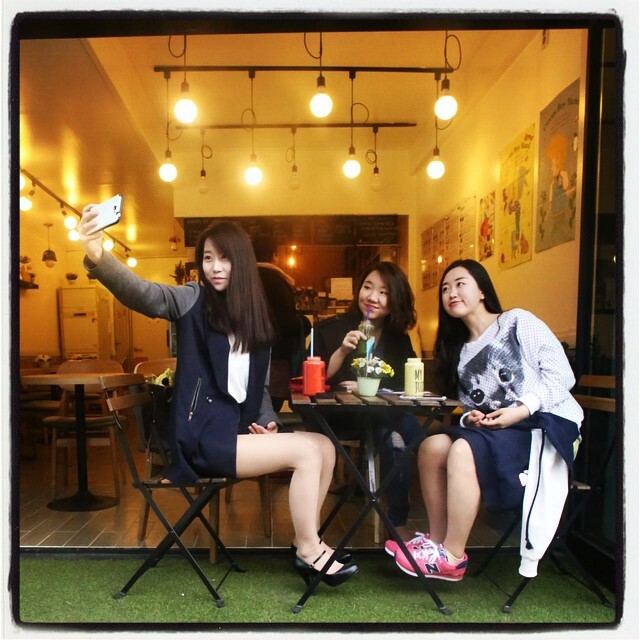 Haebangchon has become a place of culinary cultural escape for these young women, and this is why this area’s ladification has become defined by young women’s consumptive choices. Bak, Sangmee. 2010. “Exoticizing the Familiar, Domesticating the Foreign: Ethnic Food Restaurants in Korea.” Korea Journal 50 (1): 110–32. Jeong Yeongju, Heo Jayun, Jung Changmu. 2014. “Behind the Bustling Street: Commerical Gentrification of Gyeongridan, Seoul.” Social and Behavioral Sciences 170. Elsevier B.V.: 146–54. doi:10.1016/j.sbspro.2015.01.024. Kim, Ji Youn. 2015. “Cultural Entrepreneurs and Urban Regeneration in Itaewon, Seoul.” Cities 56. Elsevier Ltd: 132–40. doi:10.1016/j.cities.2015.11.021. Shin, Hyun Bang, and Soo-hyun Kim. 2016. “The Developmental State, Speculative Urbanisation and the Politics of Displacement in Gentrifying Seoul.” Urban Studies 53 (3): 540–59. doi:10.1177/0042098014565745. Kim, Won Bae. 2011. “The Viability of Cultural Districts in Seoul.” City, Culture and Society 2 (3). Elsevier Ltd: 141–50. doi:10.1016/j.ccs.2011.04.003. Koh, Minkyung, and Edward J Malecki. 2016. “The Emergence of Ethnic Entrepreneurs in Seoul, South Korea: Globalisation from below.” Geographical Journal 182 (1): 59–69. doi:10.1111/geoj.12111. Lee, Seon Young. 2014. “Urban Redevelopment , Displacement and Anti-Gentrification Movements.” 대한지리학회지 2014: 299–309. Kim, Ji Youn. 2013. “COMMUNITY OF STRANGERS: ITAEWON FROM ‘AMERICANIZED’ GHETTO TO ‘MULTICULTURAL’ SPACE.” NATIONAL UNIVERSITY OF SINGAPORE. doi:10.1017/CBO9781107415324.004.